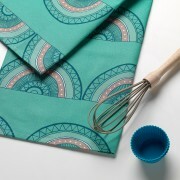 Tea Towel: Horseshoe Arch Teal features a distinctive arch motif that combines colour and pattern together beautifully. It is one in a range of dish towels by Sian Elin, featuring bright and bold graphic design influenced by Moorish architecture. Horseshoe Arch tea towel in eye catching teal is useful as well as beautiful.It is great for drying dishes or as a decor accessory. The tea towel makes a great design statement and the perfect gift for the home. Tea Towel Horseshoe Arch in teal is one in a range of vibrant new home furnishings by surface pattern designer Sian Elin. While travelling throughout the Mediterranean the designer was influenced by Moorish architecture, and the design of this tea towel features a distinctive repeat arch motif.